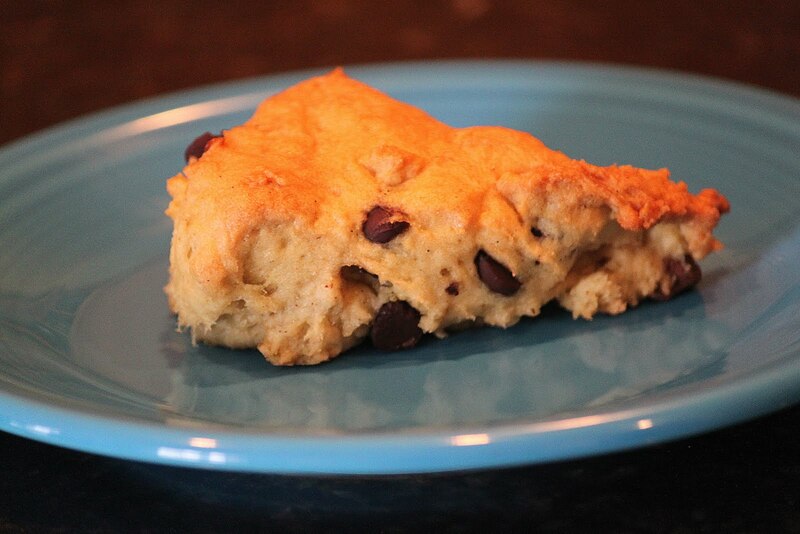 We were in the mood for something sweet and something bread like, so we opted for this modified scone recipe. The results? This made a delicious sweet (but not overly sweet) scone with a little more tenderness and moisture than a traditional scone (which we like...). How it started: I bought Bob Red Mill Wonderful Bread Mix without realizing it was a yeast bread. We are not using yeast at the moment, so I decided to use it as an all purpose flour for a scone. Easy, right? chocolate chips (maybe 1 cup?) I use Tropical Source or EnjoyLife Foods as they are dairy free options. I mixed the first four dry ingredients together in a large bowl. In a separate bowl, I mixed the liquid ingredients. Then I added the liquid ingredients to the dry bowl and my 8 year old mixed them up with her clean hands. Then she mixed in the chocolate chips. I lightly oiled my hands to press out the dough into a 9x13 glass pan. I made it about 3/4 inch thick. I then began cutting off 2x3 inch sections and placing them on a stoneware sheet aprox 1 inch apart. They required additional flattening/shaping once on the sheet, so it may be just as easy to scoop them cookie dough style and shape them once they are on the pan. If you wanted truly perfect looking scones, I would advise cooling the dough first. We baked them for 20 minutes until they were just turning light golden. If you want a crisper exterior, cook slightly longer. Variations: dried fruits in place of chocolate would be delightful, as would a ganach drizzle made from melted chocolate and coconut milk. Yum! Quick Review: As a side note, I do like the flour blend used in the Artisanal Gluten Free cookbook. I modify mine (of course), but it works well with their recipes and as a general all purpose flour. I tend to stay far away from cornstarch and potato starch in my cooking, so I was skeptical of this recipe, but the brown rice flour and sorghum balance out the starch very nicely. Thumbs up for this mix! If you are curious how the flour mix compares to other mainstream gluten free flour brands, here is a breakdown of nutritional review. It does pretty well, but Bob Red Mill still wins out for protein and fiber due to their use of bean flours.